This book critically examines the extension of the scope of application of EU environmental legislation beyond EU borders by conditioning access to the EU market on the basis of processes that take place in third countries. It makes a timely contribution to political debates about the relations of the EU with non-EU countries, and the EU's role in global governance in a policy field where the EU has been considered a global leader. The book aims to identify and explain the emerging legal phenomenon of internal environmental measures with extraterritorial implications as important manifestations of EU global regulatory power. 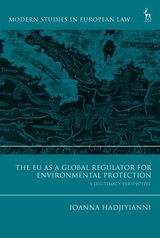 The book assesses the extraterritorial reach of EU environmental law from a legitimacy perspective and examines mechanisms that can bolster its legitimacy, focusing on the legal orders of EU and WTO law, which are key legal fora for controlling the EU's global regulatory power. Ioanna Hadjiyianni is a Lecturer in Law at the University of Cyprus and a former Max Weber Postdoctoral Fellow at the European University Institute.